This lovely Galveston vacation home is close to Jamaica Beach and is a 2 minute walk to the beach! A quick 15 - 20 minute drive will take you to Moody Gardens! You will have a GREAT time sitting at the balcony watching the ocean waves and hearing the seagulls overhead! 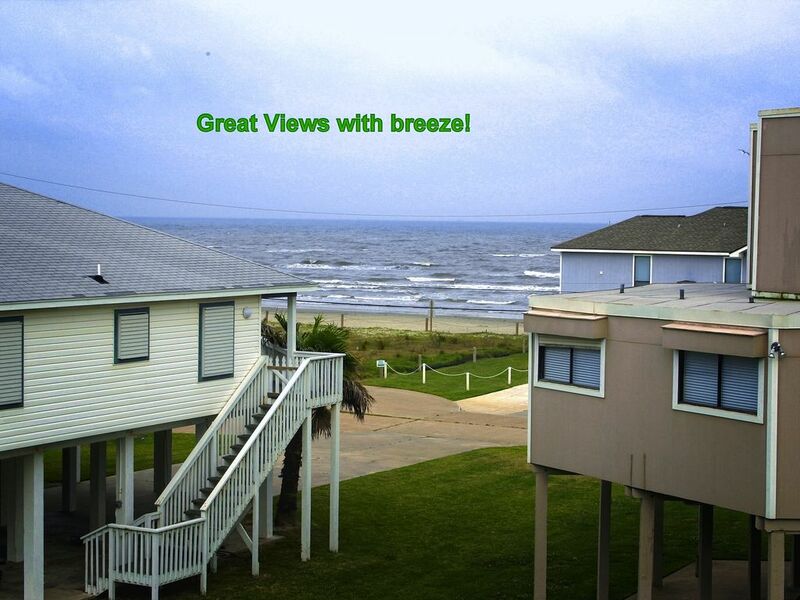 This spacious 2 bedroom; 3 full bathrooms Galveston beach is ideal for your family! A 2 minute walk will take you to Nate's West End Restaurant for a great burger and a fully stocked grocery store is only next door! Pick up some steak or seafood for a fabulous grill at our charcoal BBQ grill. You can easily walk from the beach to the grocery store for a cold scoop of ice cream! Sun bathe at the beach and walk back to the home for a cold beer or ice tea, and easily return to your sunbathing. You can also surf the waves, build sand castles with the kids and come back and grill (or have someone else grill) some steaks or seafood! Many options are available for a grand family vacation stay! No major street to cross to get to the Beach! You will not be disappointed! Your children will love spending hours playing on the beach with the beach toys provided and you will enjoy the proximity of the beach and all conveniences offered at the home! We keep additional chairs for your use in a locked storage unit that can also be used to secure your fishing poles or bicycles. Bring your beach towels and head off to the beach. An outside shower with hot/cold water is available for washing away the sand when you return! Still not convinced this is the ideal beach home! . . . . . The beach home has 1314 Sq feet of living area, 2 spacious bedrooms and 3 full bathrooms. A queen size bed and twin bunk beds are found at the second bedroom! The beach home will accommodate 6 people in a bed and 2 people in the sleeper sofa bed, for a sleeping capacity of 8! Make our home - your home at the beach! And make memories to share a lifetime. Bring your laptop and stay connected with families and friends with our wireless internet or enjoy watching TV on our smart,large screen cable TV. We have many guests who also rent our beach home next door (HomeAway#973827) to have a vacation to remember with best friends or relatives. The luxury you find at our other listings can be found here!! My husband and were enjoying sharing our beach home and condo (Docs Quarters at the Beach and Docs Quarters at the Seawall) when the beach home next door came up for sale. We decided to purchase the beach home which is next door to our 3 bedroom; 3 full bathroom beach home (Docs Quarters at the Beach). We found many families with a desire to stay close to the beach and enjoy the relaxation that only a beach can offer! We also wanted to provide vacationers, with multiple family members, the option of sharing the same beach but still having the privacy of being in separate quarters. Our beach is close to Jamaica beach ( Karankawa Beach) not crowded and is a location well known by frequent island guest renters. We also enjoy this location, it is secluded but close enough (10 miles to the seawall) to all of the island happenings! A unique benefit of renting our home is its phenomenal location. It is far enough from town to have the small town feeling but close enough to enjoy Galveston and all its attractions. Our guests LOVE the proximity to the beach as well as the proximity to a well stocked grocery store and Nates Restaurant. We are only 10 miles from the Seawall, which is also a big PLUS! Excellent beach and ocean view!!! Enjoy the ocean view and watch the seagulls enjoy life!! There are 2 air conditioner units in this unit. There is a full size new washing machine inside the unit. there is a full size dryer inside the unit. Queen size sleeper sofa, love seat, recliner and 1 extra swivel chair located in the living (entertainment) area. Microwave available in this well stocked kitchen. Two balconies! One balcony attaches to the upper part of the beach home from the living area with excellent views of the ocean, enjoy the breeze, listen to the ocean while drinking your coffee. Loved the stay in the beach house. Everything was great. The home was nice. The location was a bit far from the main area were all the action was for our family it was perfect. The home was well stocked with needed cooking materials. The beds were comfortable. Being able to walk to the beach was the best but we only did it once. The snake caution signs worried us but we never saw any snakes. The owner was very kind and greeted us upon our arrival. Over all we loved our stay. Thank you for your review! It was my pleasure to have met your family! I’m sorry you didn’t spend much time at our almost private and solitude beach. We are about 20-30 minutes from the main attractions. Quiet and relaxing. Nice gulf view. Nice townhouse. Plenty of space. Quiet and peaceful. Thank you for the lovely review! We greatly appreciated having you stay at our home! I'm really sorry the weather couldn't have been better! Timeless beachy feel and decor. The floor plan is fantastic with 2 balconies, 3 full baths with 2 bedrooms - 1 family focused and 1 master. Perfect for us travelling with grandparents and a family with young child. The beach is so close - an enjoyable walk to beach comb. There's a grocer and restaurant (yummy local feel kinda joint) within a few steps. We were thankful to be away from the hustle bustle of town, it's peaceful (although near the highway) and relaxed. If you want to get to Galveston or go to a restaurant, aside from nates, or see the sights it's a 30+ min cab ride....$40 to Galveston one way. We wished there had been bikes so we could've biked to Jamaica beach. All in all a great way to star our vacation and get away from the bustle with all the charm we'd hoped for and great (safe - good handrails) balconies for all. I'll also add that Yolanda was very accommodating when our plans got complicated by intense fog. They allowed us to check out late and did so kindly in coordination with cleaning staff. Much appreciated! Thank you for the lovely review! It is greatly appreciated! I’m really sorry we didn’t have any bikes available for your family. What a beautifully decorated, clean, and perfect place to celebrate my daughter's 16th birthday! Thank you for sharing your home with us. We hope to be back soon! Thank you for the lovely review! I hope to see you this summer! The property was very comfortable and in a great location. We had a great time! Thank you for the lovely review! Please visit us again! Approximately 45 Minutes To Hobby Airport . We provide an accidental damage waiver for $35.00 that provides up to $300 of accidental damage to the interior of the beach condo. Therefore no damage deposit is necessary.Damage waiver does not apply for reckless use of the property.